Are your kids bored with the regular pb&j? I got your back with this tasty (and simple!) 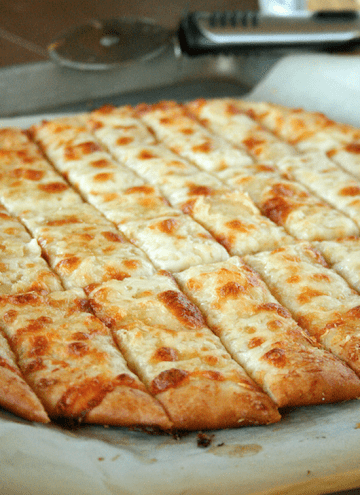 list of 50 more school lunch ideas. Brown bagging it has never been so delicious. PS-I have written a school lunch guide, listing all the ins and outs of how I put my kids’ school lunch together. Get the free PDF downloadable guide here. 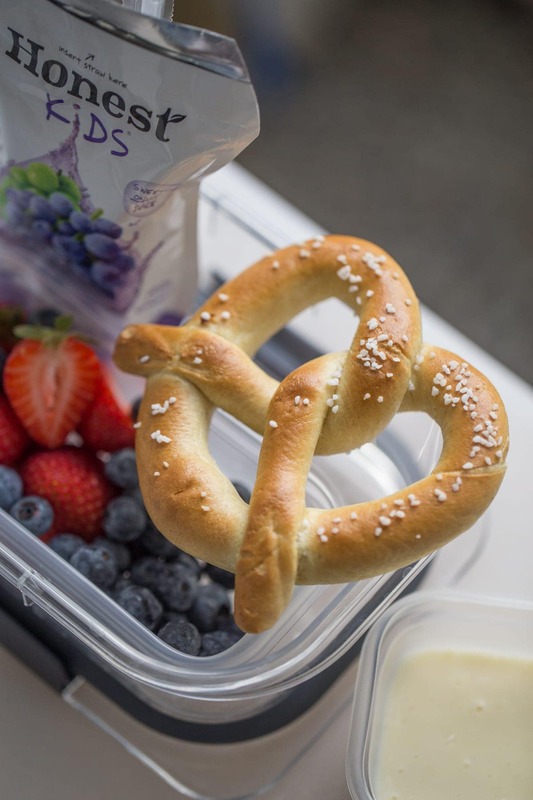 Soft Pretzels with queso dip: store-bought frozen pretzels with queso dip either cold or in a thermos to stay warm. Pepperoni Pizza rolls: make ahead pizza rolls with crescent dough and use as kids’ lunch all week! Simple Macaroni Pasta Salad: make a batch at the beginning of the week! Cherry Chocolate Cheesecake Dip: a surprisingly healthy dip, made with greek yogurt, fresh cherries and dark chocolate. 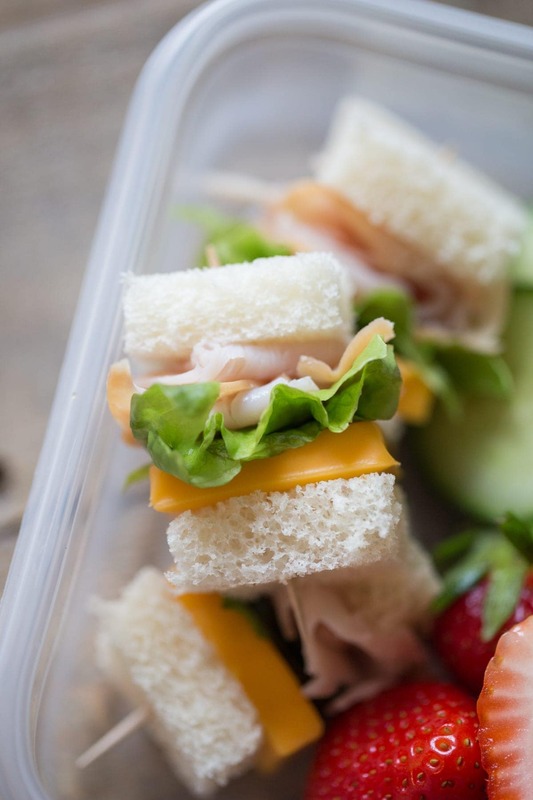 Protein Lunch Boxes: switch it up how you like between crackers, hard boiled egg, peanut butter, celery and more! 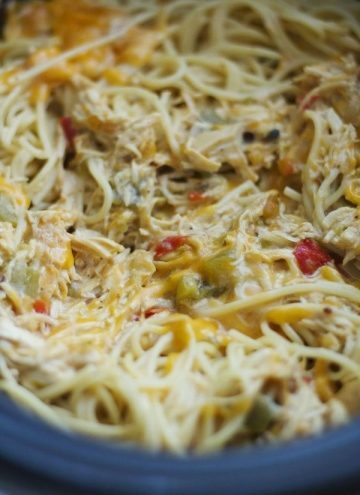 Crockpot Chicken Nacho Dip: a thermos lunch that tastes amazing with chips or crackers! 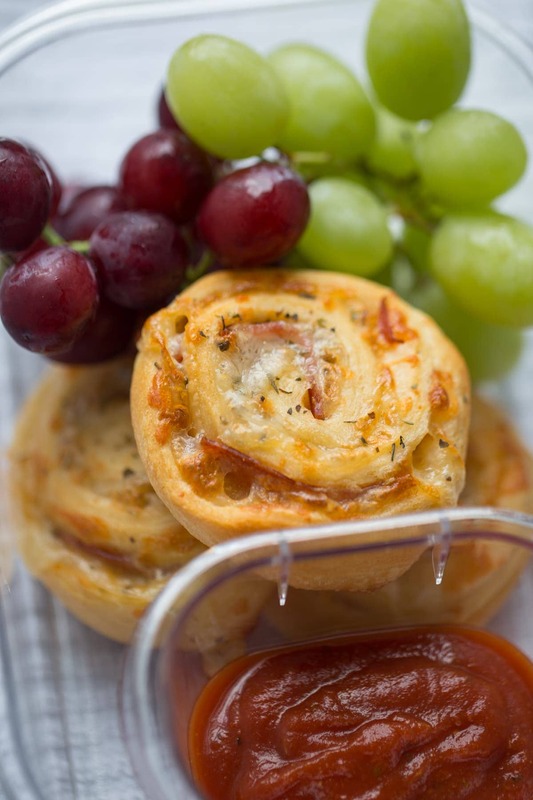 Chorizo Manchego Pinwheels: make ahead, store in the fridge or freezer for a week of lunches! Sesame Noodle Salad: an asian pasta salad! Just add the crunchy noodles before serving if packing for school lunch. Epic Chicken Salad: a bunch of grated zucchini is hidden in this recipe and no one will even know! Healthy and delicious. Caprese Salad: if your kids like tomatoes and cheese, this is a simple (and yummy!) lunch option. The Best Tuna Fish Sandwich: if you think you don’t like tuna, give this recipe a whirl! Creamy with a vinegary bite, served on fresh croissants! 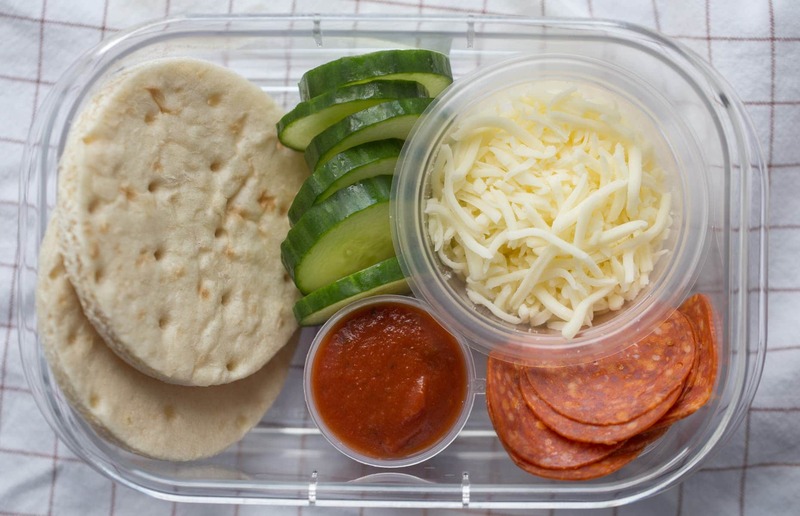 Homemade pizza lunchables: store-bought pizza dough, cut into large circles with pizza sauce, grated mozzarella and pepperoni on the side. Cowboy Caviar: make a big batch of this at the beginning of the week and see if it lasts! It’s so so good with chips and gets better the longer it sits in the dressing! Jalapeno Artichoke Dip: dip veggies, soft pita or crackers into this creamy and slightly spicy dip! Tuna Pasta Salad with Dill & Peas: seems a little strange, but this is one of my kids favorite pasta salads ever! The tuna isn’t super strong and the dill and peas certainly make it extra tasty! Avocado Toast: add different toppings to switch it up! Mediterranean Quinoa Salad: serve warm or cold…delicious both ways. Fancy Chicken & Pecan Salad: also yummy warm or cold and filled with chicken, pecans, pasta and grapes. Soft Whole Wheat Dinner Rolls: fill with meat and cheese for a tastier sandwich! Parmesan Crusted Chicken Tenders: Make ahead on Sunday night and serve warm or cold all week! My kids LOVE these. BLT Chopped Salad: the basil greek goddess dressing on this is to DIE for. Saucy White Cheddar Shells and Cheese: made from scratch with extra sauce so the pasta doesn’t dry out in the thermos! Hummus and Veggie Wraps: tortillas filled with creamy hummus, cucumber, carrot, peppers and anything else you have on hand. Roasted Veggie and Quinoa Salad: nutritious and delicious! Serves a crowd. Easy Peel Hard Boiled Eggs: turned into deviled eggs or egg salad! Mini Salad Pita Pockets: salad ingredients stuffed into mini pitas, served with dressing on the side. 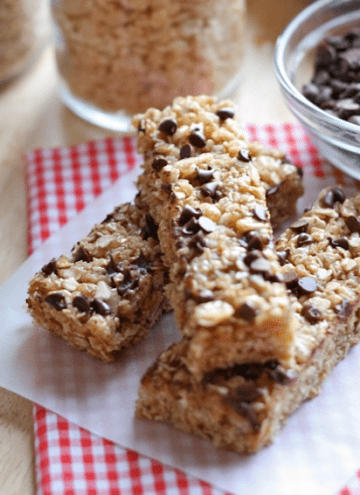 Snack Boxes: instead of having one main course, try a series of snacks! Store bought or homemade quiche: serve warm, room temperature or cold. Pasta e Fagioli with Kale: veggies, beans and pasta galore! Perfect for the fall or winter months. Warm Buffalo Chicken Dip: dip bread, crackers, chips or veggies into this tasty and creamy dip! Good warm in a thermos or cold. Low Fat Lemon Poppyseed Loaf: a sweet treat to add to a lunch box! Serve with fruits, veggies and cheese cubes to make a complete meal. 10-Minute Broccoli Cheese Soup: a last minute school lunch for the cooler months. Harvest Apple Blue Cheese Salad: Sweet, creamy and crunchy with hardly no prep time needed. Soft White Sandwich Bread: make one or two loaves to use for sandwiches throughout the week. A great way to make an even tastier lunch! Sesame Butternut Squash Pan Fried Noodles: if your kids don’t mind vegetable noodles, this might be a great option! Lemon Chicken Quinoa Soup: so good and good for you!! Crack out your thermos! Creamy Crockpot Cauliflower Soup: another lunch idea for the thermos! 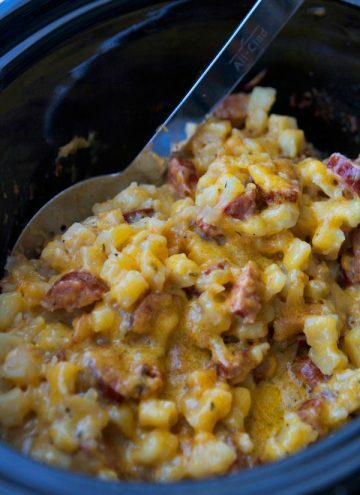 Serve cheese and bacon on the side. Summer Corn Avocado Basil Salad: a colorful and flavorful salad my kids actually like! Add mozzarella cubes for a little protein. Southwest Guacamole Hummus: the best of both worlds with this half guacamole/half hummus dip! Serve with pita or tortillas chips! Healthier Egg Salad: make a sandwich or serve alone with veggies and crackers on the side to dip. Morning Glory Muffins: I serve these muffins for breakfast AND lunch because they are packed with carrots, zucchini, nuts and coconut! Mediterranean Greek Yogurt Dip: if your kids love those mediterranean flavors, this would be a yummy option! Chinese Chicken Salad: colorful, sweet and crunchy! Serve the chow mein noodles on the side so they stay crunchy. Skinny Mini Chocolate Chip Muffins: a fun Fall treat to add to any lunch box that you don’t have to feel guilty about. Tomato Basil Alphabet Soup: make with or without the mini turkey meatballs! These lunch box ideas are so awesome, better than making sandwiches and hearing my kids say, “mom, can you make me a sandwich again for lunch?” Then after Christmas they say, “mom, can you make me anything but sandwiches?” UGH. I also love the snack boxes for when we go out and about or on our 5 1/2 hour trip to my parents with the kids. These boxes keep them quiet. Lauren, thanks for all of your amazing posts on Lauren’s Latest and posts on Facebook, you are my mid-day therapy without being a therapist. Plus I love the posts about New York! Cheers, Shannon……………My birthday is September 18th! I’m turning 45 this year. I first read this when you posted it as I had been looking for more lunch ideas for my Littles to eat, not just for school, but at home also! I love reading your posts and love your ideas. This is so helpful!! I am always looking for school lunch ideas!! 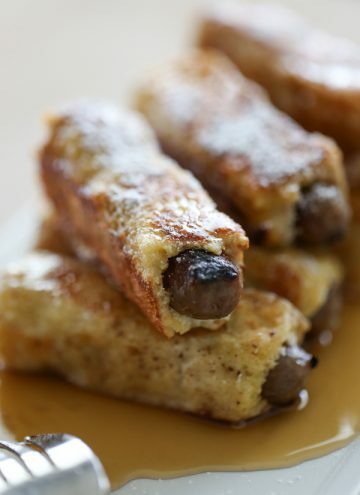 Making my Costco list right now so I’ll have plenty of lunch box goodies ready to go! Thank you for this list! It is so easy for me to get stuck in a rut with my kids’ lunches. We have already tried the Cherry Chocolate Cheesecake Dip & Caprese Salad. Can’t wait to try the Pepperoni Pizza Rolls next. Thank you so much for all the wonderful ideas!!! Sometimes you get into the sandwich rut and I feel inspired to branch out, my kids will be thrilled!!! I have a Kindergartener this year for the first time so I am excited to try some of these!